Anyway to force this controller to drop below 20%? Looks like that’s the lowest setting. Do you have these for sale somewhere? I have 1 extra, Shoot me a PM. Any chance you could walk me through adding a device handler? Ranga Pedamallu; initial release and zigbee parsing mastermind! Stephan Hackett; new composite (child) device type genius! into what I believe is a new device handler in my smart things. I am so lost what to do next. This may help if you’re new to using custom code on SmartThings. I recently bought a zigbee antenna to replace the one I accidently cut on my hampton bay module. I installed it this morning and so far the controller has been working like a champ. I am wondering if the new antenna has helped my range. It has only been 1 day so far but, so far so good. 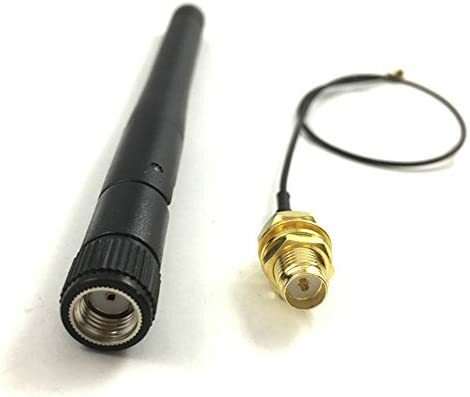 May be a cheap way to improve the performance by replacing the antenna. It has a standardized plugin connection so it is very easy to do. Its quite large so I may buy a stubbier one to hide it more. Great solution. The included antenna is terrible! This looks to be just what i need. Despite repeaters in-and-around this, the fan still loses contact pretty frequently. Thanks @rgrandy for the idea! I hate to be that guy who is too lazy to do his own homework and asks the community to do it for him, but… my fans are way high and tough to reach. I don’t remember an antenna connector. I just recall a small wire dangling out of the controller. Is there a male u.fl connector up there? I’d assume it to be a pcb mount connector. You’ll need to open up the casing on the controller. FWIW I tried a better antenna because I was having connection issues, but it didn’t really help much. I learned that the fan blades spinning interferes with the zigbee signal, and it kept dropping off when the fan was running. Ended up putting a Tradfri plug on top of a bookshelf, which results in a repeater with line of sight to the antenna over the fan blades. I don’t have a decent way to get a repeater above the fan blades. And it’s aggravated by the fact that my blades are metal. But, my observation is that the signal loss is no more likely when the fan is running than when not. Yeah inside the case there is a u.fl connector. Just pop the old one off and the new one on. Still from the day I put the new antenna on to today I have had solid connection and no dropping. Which is way different than with what I had before. Although I did damage and attempt to fix the old antenna so I may have a better experience than some with this change. Also I don’t have metal fan blades. I also need to find a good way to hide the new larger antenna. @marktheknife where are you buying the in wall remotes? It looks like one Home Depot sells also comes with a transmitter module which I obviously don’t need at this point. Is there anywhere you can buy just the in wall module? The in wall remote is RF only, but does control the wink enabled controller. The bundled receiver with the remote can just be thrown out. You can’t buy just the in wall remote at retail, but you may be able to get it from King of Fans. However, the price is probably cheaper as a kit. As I understand it, the controller, Universal Wink Enabled White Ceiling Fan Premier Remote Control, is Zigbee enabled with no special extensions to the protocol. And is directly Wink compatible. This is where I get fuzzy. I am VERY new to Smartthings, having just set up my ADT Smartthings Hub and sensors this past weekend. My question is, is this fan / light controller directly compatible with Smartthings, most specifically ADT Smartthings, and if not, and I have to go with a custom device handler, can someone be kind enough to point me at an idiot proof method to get the software working? It will require the installation of custom device handlers. Log in at https://graph.api.smartthings.com/, and select the default device location. If you can see your hub and devices there, you shouldn’t have a problem. It will require the installation of custom device handlers. Log in at graph.api.samsung.com , and select the default decide location. If you can see your hub and devices there, you shouldn’t have a problem.